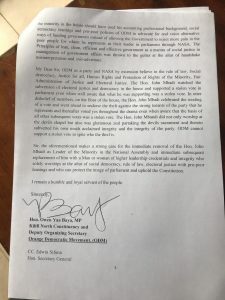 Kilifi North MP Owen Baya has written to the Orange Democratic Movement (ODM) Party leader seeking the removal of Suba North MP John Mbadi as Minority leader. In a letter to ODM party leader Raila Odinga, Mr Baya wants Mbadi replaced for being unconvincing weak mobilizer and pathetic leader who can no longer convince a hold the minority party in National assembly together. He accused the minority Leader of advancing ideas of his Majority leader counterpart Aden Duale at the floor of the house to an extent they have become identical Siamese twins joined at the head and hip. 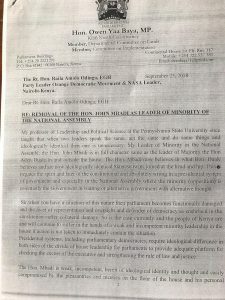 “Hon Mbadi is weak, incompetent, bereft of ideological identity and thought and easily compromised by the pleasantries and niceties on the floor of the house and his personal friendship to the majority leader Aden Duale who are residential neighbors,” read a letter sent to ODM leader Raila Odinga. “In the circumstances and on the similarities of the two leaders, it is apparent that we probably need one of the the two in the leadership of the house and I guess Aden Duale is what even John Mbadi needs himself and therefore Hon. Mbadi is unnecessary, ” the letter adds. The MP said Mbadi must be kicked out as he had completely failed to adhere to the Orange party policy, manifesto and ideology and hence selfishly misadvised and pressured the party and coalition leader to endorse the said instruments being introduced in parliament. 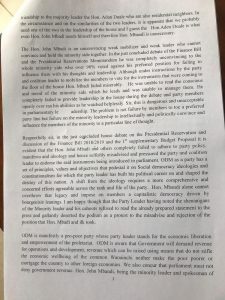 He contends that during the just concluded debate on the finance bill and the presidential Reservations Memorandum he was completely unconvincing to the whole minority side who over 90 per cent voted against his preferred position for failing to influence them with thoughts and leadership. Although under instructions by the party and coalition leader to mobilize members to vote for the instruments that were coming to the floor of the house, the first time lawmaker said Hon. Mbadi failed miserably. “He was unable to read the conscious and the mood of the minority side which he leads and was unable to manage them,” Mr Baya, who is also the Orange Party Deputy Organizing Secretary. 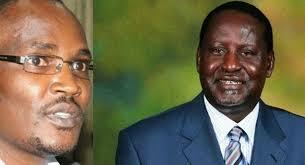 But a defiant Mr Mbadi has dared the MP to make good his threat and declared that he is going nowhere. “Am not shaken at all. Let him proceed, it is not a walk in the park,” Mbadi told Kisasa news on phone.